Repurposing Waste Saves The Environment & Money Too! Dealing with waste efficiently always presents a significant challenge to business owners. In addition to reducing the business’s negative impact on the environment, waste disposal should be implemented with the goal of maximizing resources, reducing costs, and enhancing profitability. By now, conscientious consumers already know of the environmental hazards posed by excessive plastic use and paper consumption, and have minimized or avoided these practices. The good news is that a number of businesses have gotten around to implementing waste reduction and recycling policies as well. These polices have proven to be remarkably profitable for businesses that implement them, while providing the beneficial effects to the environment. Not many people have given thought to recycling disposable diapers, but nappies can actually be used as highly-effective building and manufacturing materials. In treatment/recycling plants all over Scotland, nappies are cleansed of waste and sterilized. The plastic and celluloid material is then sold to businesses that manufacturer roofing tiles, road signs, park benches, and even railway sleepers. With more than 450,000 diapers used in the country every day, recycling diapers definitely does its part in reducing environmental waste. Paper recycling and reduction is one of the most commonly practiced ways to lessen the negative effects of paper use on the environment. But paper can be repurposed for other applications as well. In the food service and fresh produce industries, sheets of organic, biodegradable paper are laid on top of fruits and vegetables, keeping them fresh for up to two-four days longer than if they were packed with regular materials. This can significantly reduces wastage and can have a noticeable effect on a store owner’s bottom line. The use of wood and wood-based products takes a hefty toll on the environment, but it can be reduced significantly by reusing the cellulose fibers in wood, cardboard, and agricultural waste. Scraps are first milled with the resulting pulp mixed with water. After heating and pressurizing, the pulp is fashioned into durable panels that can be used for a number of different applications, from wall paneling to tables, household accessories, and even furniture. These materials can be further recycled as well, and they have the additional benefit of not containing any toxic substances. 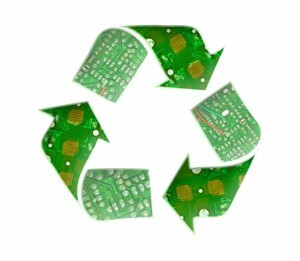 There are countless applications for which common waste materials can be recycled and repurposed. From manufacturing clothes, common household implements, building materials, and more, waste materials aren’t just burdens to get rid of. With a proper recycling system in place, waste materials might just be a profitable source of income for many businesses. What next for the revolution in waste management? Copyright Ecological Communities 2014 - Green Living Tips, Waste Disposal and Recycling Information.